Ex-Russian anti-corruption official Zakharchenko applies to ECHR over asset forfeiture | Russian Legal Information Agency (RAPSI). 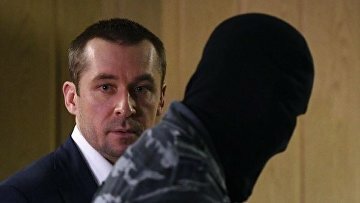 MOSCOW, October 11 (RAPSI) - Ex-Russian anti-corruption official Dmitry Zakharchenko charged with taking bribes has filed a complaint with the European Court of Human Rights (ECHR) against forfeiture of assets belonging to him and his relatives to the State, his lawyer Alexander Gorbatenko has told RAPSI. On Wednesday, the Supreme Court of Russia dismissed Zakharchenko’s appeal against seizure of more than 9 billion rubles (about $136 million at the current exchange rate) including 27 real estate objects in elite neighborhoods of Moscow, 4 high-priced cars, 8 billion rubles and a gold bar. Earlier, a court granted a lawsuit filed by the Prosecutor General’s Office and confiscated money and property belonging to Zakharachenko and his relatives. The ruling came into force in March. On July 12, the Investigative Committee reported transfer of 9 billion rubles to its bank accounts. Ex-Russian anti-corruption official Dmitry Zakharchenko is charged with corruption and hindering conduct of preliminary investigation. According to investigators, in 2014, Zakharchenko and his accomplice received $800,000 from a restaurant businessman. Initially, they demanded 5 million rubles ($75,000). In 2015, they allegedly demanded from that businessman a 50% discount card of his restaurants, and therefore the defendant saved over 3.5 million rubles during bill payment. Moreover, investigators claim that in 2016, he warned a familiar woman about forthcoming searches as part of a fraud case and organized taking of all documents and office equipment out to prevent their seizure. Zakharchenko was arrested on September 8, 2016, on suspicion of taking a 7-million-ruble (about $105,000) bribe. During searches at his sister’s apartment law enforcement officers found around 9 billion rubles. He denied any relation to the seized funds. According to case papers, Viktor Zakharchenko, the father of ex-official, is charged with being an accessory to embezzlement. He also pleaded not guilty.